Like many mechanical domestic servants, garage door openers are woefully underappreciated ... until that fateful day when they decide to stage a revolt. The aftermath can get ugly, as angry heads of households are forced to exit their cars and hoist their own doors manually. Or worse, homeowners are trapped inside their garages, powerless and completely at the mercy of their misbehaving machines. Don’t let this happen to you. Remember, you can always disable the opener by pulling that dangling red handle. This buys you time to investigate the cause of the unrest and to look for a quick solution or simply call in a professional. Either way, the garage door opener will win the standoff, getting the appreciation—and maintenance—it feels it deserves. 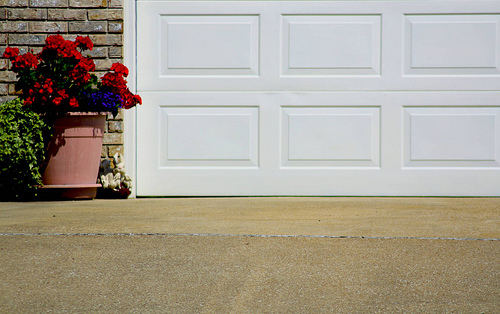 Here are 5 common ways a garage door opener acts weird, with recommended solutions. Door starts to close then quickly reverses. The safety sensors are letting you know the system's working but needs attention. Check the two infrared sensor "eyes" near the bottoms of the door tracks. Most have a little indicator light to tell you what's up. A green light on both sensors means all is well. If one or both lights are red, blinking or not lighted at all, first make sure nothing's blocking the sight path between the eyes, such as spiderwebs or leaves. Even dust on the lens can create a problem. Then, make sure the lenses point toward each other; the units often wiggle loose or get bumped off track. Another cause could be the wiring connecting the sensors to the opener motor. Sometimes you have to wiggle the wire connection or bend the wire this way or that until the indicator light comes back on. On most openers, you can override the safety system by holding down the wall button until the door closes completely (the manufacturer assumes you'll be watching for any safety hazards or won't try the dumbest possible way to tenderize a steak). If the problem turns out to be faulty wiring or sensors, have them replaced ASAP. Motor runs but the door doesn’t move. Possibly the chain (on chain-drive systems) somehow jumped off track, but most likely the chain sprocket (or a related part) has gone bad. The chain is driven by a little toothed sprocket that looks just like one on a bicycle. Many of these are metal and aren't likely to wear out, but they can. A more likely culprit is a plastic gear that turns the sprocket. Look for the sprocket on top of or inside the motor unit. If it's loose or unattached, you need new parts. You can find gears and sprockets online, along with tutorials on how to replace them; they're pretty cheap. On the other hand, if you don't enjoy working on greasy parts while your head is jammed sideways against the ceiling, call a garage door pro (and it might be time to consider replacing an old opener. Door closes, then opens automatically, OR it doesn't open all the way. All openers have two limit switches that tell the door how far to open and close. If your door closes all the way down then reverses itself and goes back up, the close limit switch needs adjustment. If the door won't open completely, the open limit switch needs some fine-tuning. Limit switches are simple to adjust, but they're specific to the model of opener. Consult your owner's manual to fix this problem yourself. Otherwise, it's a quick job for a pro. Arriving home at the end of the day to find your garage door wide open raises a host of alarming questions. Did you forget to close the door? Are you being robbed? Does your neighbor share the same remote code? Do you have ghosts? The real answer is likely to be less troubling, but it might be expensive. Power surges (from lightning, for example) can mess up the electronics in an opener motor, resulting in erratic behavior. On a simpler level, there may be a problem with the wall button, the wiring between the button and the motor or the remote. Try this clever method for identifying the culprit: Start by taking out the batteries from the remote and using only the wall button for a few days. If that works, replace the remote. If not, it's time to switch switches. Disconnect the wall button wiring from the opener motor, and use only the remote for a few days. If that solves the problem, replace the button wiring—and the button unit, if the problem continues. Opener seems strained or unusually noisy. There's a safe way and an unsafe way to check this out. Please use only the safe method: Close the door all the way, then disengage the opener using the emergency release cord. Lift the door manually to see how it feels. If it's really heavy, the door probably has a broken spring; leave the door closed and call a pro. If lifting the door isn't too bad, but it won't stay open by itself at the half-way point, the springs are either worn or out of adjustment. If the door lifts easily like it's had too much coffee and can't wait to start the day, the springs need adjusting. All of these things can wear unnecessarily on the opener motor and should be addressed by a pro. The case of a broken spring is downright dangerous; that's why you always close the door before disengaging the opener.